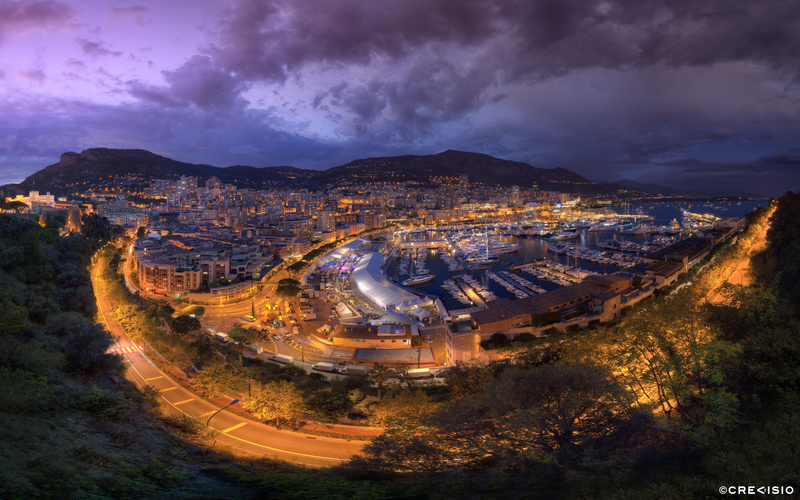 Cloudy sunset panorama over the Monaco Yacht Show 2015, with a view over the Port Hercule. This photograph was taken from Monaco-Ville, and spans a full 180 degrees from the Palais du Prince on the left, over the Monaco port and to Roquebrune, Menton and Italy on the right. The full resolution of this 220 megapixel panorama is 18,799 x 11,749 pixels at 300 dpi. You may download a high resolution version (10,240 x 6,400 px) for personal use by clicking on the link below. For commercial use, please contact Crevisio.